Joanne White posted Sunday April 7, 2019. Qualifying got underway and while Aaron Kelly managed to initially secure quick time when the first group hit the track, but faded back to eleventh as some of the more experienced groups hit the track. Lachlan McHugh secured Quick Time, stopping the clock at 11.330 seconds, with Luke Oldfield (11.422) second quickest ahead of Andrew Scheuerle (11.572). Ben Hilder (11.597) and Bryan Mann (11.696) rounded out the fastest five, while Peter Lack (11.699) missed out on a top five result by just three thousandths of a second. The top twelve drivers al managed to get under the 12-second mark, while the fastest eighteen were separated by less than one second. Geoff Davey and Kevin Britten shared the front row for the start of heat one, and while both drivers got a great start Ryan McNamara, from position three, charged on the bottom, the trio going three-abreast moments after taking the green. As Britten moved slightly ahead of Davey and led the field towards turn on, McNamara faded slightly as Peter Lack and Brent Kratzmann raced around the outside, with Lachlan McHugh following soon after. Lack got underneath Kratzmann as they rounded turn two, only for Kratzmann to quickly return serve as they made their way though turn three, the pair putting on a captivating show for race fans. Lack fired back half a lap later, again racing through on the bottom, leaving Kratzmann with McHugh on his tail, while at the front of the field Britten had opened a sizable lead on his rivals. Lack soon made his way past Davey, with Kratzmann and McHugh following a couple of laps later, and set his sights on Britten and began closing the gap to the leader. Towards the rear of the field Ryan McNamara, while searching for a way past Davey, was coming under increasing pressure from Aaron Kelly, but there was nothing that could stop Britten out in front. Kevin Britten went on to take the win ahead of Peter Lack and Brent Kratzmann, with Geoff Davey home in fourth ahead of Ryan McNamara, Aaron Kelly, Peter Campbell and Libby Ellis. Lachlan McHugh pulled out of the event with mechanical issues after completing just five laps. Dave Whell started heat two from pole position with Anthony Lambert alongside and Andrew Corbet and Michael Saller close behind. While both Whell and Lambert got a decent start it was Lambert on the high side who led the field through turn one. Saller quickly got around Whell and moved into second, while Luke Oldfield made short work of getting around Bryan Mann and Andrew Corbet, before racing around the high side of Whell and into third with just half a lap complete. Oldfield turned his attention to Saller while Corbet and Whell negotiated over mid-field positions until Bryan Mann came between them. Oldfield spent a few laps closing in on Saller, then a few more relentlessly searching for a way past, before getting around the outside of the N56 racer as they rounded turns three and four with just three laps left to run. Oldfield quickly set out after Lambert, closing the gap more with each passing lap, but Lambert had built a considerable lead that proved unassailable in those final three laps. Anthony Lambert got the win ahead of Luke Oldfield and Michael Saller, with Andrew Corbet home in fourth and leading Bryan Mann, Brett Minett and Dave Whell across the line. Brad Ayers, in his first meeting back in the drivers seat after some time on the sidelines, had mechanical issues in the #11 racer and pulled out of the event after just one lap. Heat three started with Kristy Bonsey and Adam Butler sharing the front row, with Butler leading the way when the light went green. The race was however quickly brought to a stop when Ben Hilder inverted the Q12 racer in turn two. Hilder was unscathed, and, despite a rather crumpled main wing, restarted the event from the rear of the field. Second time around it was Bonsey who secured the race lead and while Butler initially held down second, there was less than half a lap completed when Kevin Titman raced through on the bottom to relegate Butler back to third. Titman set out after Bonsey while deeper in the field Andrew Scheuerle searched for a way past Allan Woods, and Jason King defended his position from Paul Rooks. Rooks soon got the better of King, with Hilder following him past on the inside of the NQ69 racer, with Rooks then closing in on the back of Scheuerle and Woods as the laps ticked over. Kristy Bonsey was dominant out in front, taking the win with a margin of 1.863 seconds on second placed Kevin Titman. Adam Butler held on to finish third ahead of Allan Woods, Andrew Scheuerle, Paul Rooks, Ben Hilder and Jason King. Heat four hit the track with Dave Whell and Andrew Corbet to lead them to the green. Whell got the initial jump but Corbet was too quick on the top side and quickly powered into the race lead. Luke Oldfield made his way ahead of Kevin Titman before racing around Anthony Lambert and switching to the low side to slide underneath Ben Hilder, all before the race was even half a lap old. By the end of the first lap Oldfield had raced around the high side of Whell and into second, his sights firmly set on Corbet and the race lead, while behind him Titman briefly challenged Hilder for position before a small mistake in turn two saw him surrender positions to Anthony Lambert and Aaron Kelly. Hilder was magnificent as he relentlessly pursued Whell, patiently searching for a way through before making his way around on the highline, while Lambert, Kelly and Titman closed in on the back of Whell as the laps wore on. Kelly began searching for a way underneath Lambert, while Titman had a brief look on the inside of Kelly, but the race was soon brought to a stop when Kelly hit a rut in turn two before making heavy contact with the wall exiting the corner. Unfortunately for Kelly his race, and his night of competition, was over. Corbet led the restart with Oldfield and Hilder on his tail and two laps left to run. Oldfield was all over the back of Corbet once they took the green, but another caution, this time for the spun car of Libby Ellis, brought the race to another stop. With two laps still remaining it was again Corbet who led the restart but Oldfield was phenomenal in the Q17 racer, searching high and low for a way past before racing up the inside of Corbet as they raced past the white flag with one lap left to run. Luke Oldfield got the win ahead of Andrew Corbet and Ben Hilder, with Kevin Titman home in fourth ahead of Anthony Lambert, Dave Whell, who slowed with one lap remaining with a flat right rear tyre, and Libby Ellis. Aaron Kelly did not finish the event while on-going mechanical dramas for Brad Ayers saw him unable to take the green at the start of the event. Geoff Davey and Kristy Bonsey shared the front row for the start of heat five, with Bonsey getting a brilliant start when the green flag flew, the Q42 racer quickly securing the lead ahead of Davey and Michael Saller. Brent Kratzmann raced underneath Peter Lack and Kevin Britten and set his sights on Saller, while Lack quickly displaced Britten before racing up the inside of Kratzmann half a lap later. Saller got underneath Davey to move into second, leaving Davey to try and defend his position from Lack and Kratzmann, with Lack getting underneath the NQ74 racer as they rounded turn three and Kratzmann getting by on the outside of turn two a few laps later. Britten and Davey had a thrilling battle mid-field before Britten eventually got around the outside, while at the front of the field Saller had managed to close in on the back of Bonsey as the leaders began navigating lapped traffic. Saller had a huge look on the inside of Bonsey as they rounded turn one for the final time, but Kristy Bonsey refused to surrender the lead, valiantly fighting back on the bottom to maintain the advantage and take the win. Michael Saller crossed the line in second and led Peter Lack, Brent Kratzmann, Kevin Britten, Geoff Davey, Brett Minett and Peter Campbell across the line. The sixth and final heat of the night started with Adam Butler and Ryan McNamara from the font row, with the hard-charging duo of Allan Woods and Lachlan McHugh right behind them. McNamara got a brilliant start and quickly secured the lead, while McHugh immediately got the better of Woods and began searching high and low for a way past Butler. Butler held down second but soon succumbed to the pressure from McHugh, surrendering the position to the Q23 racer just a couple of laps into the race. While Butler focused on trying to defend his position from Woods, McHugh began closing the gap to McNamara, while deeper in the field Paul Rooks searched for a way underneath Andrew Scheuerle as Scheuerle tried to find a way past Bryan Mann. Scheuerle eventually got underneath Mann in turn three, only for Mann to immediately race back through underneath Scheuerle as they rounded turn four, while at the front of the field McHugh and McNamara were embroiled in their own intense battle for the race lead. McHugh got through underneath McNamara in turn three, with McNamara regaining the lead in turn four, the pair making contact soon after as McHugh again raced through into the lead. Lachlan McHugh got the win ahead of Ryan McNamara and Allan Woods, with Bryan Mann home in fourth. Adam Butler crossed the line in fifth and led Andrew Scheuerle, Paul Rooks and Jason King home. The Dash event saw Luke Oldfield and Peter Lack share the front row for the start, and while Oldfield was able to get his nose in front when the lights went green, Lack fought back on the top side, challenging Oldfield through turn one. Oldfield secured the lead but Lack was not done and fought back hard on the bottom as they headed towards turn three, having a big but unsuccessful looking underneath Oldfield as they rounded the corner. Lack persisted on the bottom through turn four, finding the speed he needed as they raced down the main straight, with Lack on the bottom taking control of the race as they completed the first lap. Oldfield fought back but soon surrendered second to a hard-charging Lachlan McHugh, while deeper in the field Bryan Mann, Ben Hilder and Brent Kratzmann were putting on a show as they negotiated over positions towards the back of the field. Peter Lack got the win, leading Lachlan McHugh and Luke Oldfield across the line, while Andrew Scheuerle claimed fourth ahead of Bryan Mann. Brent Kratzmann eventually got underneath Ben Hilder to secure sixth, leaving Hilder in seventh ahead of Michael Saller. Ten cars lined up for the twelve lap B-Main, with Anthony Lambert and Adam Butler to lead them away. Unfortunately contact between Lambert and Butler as they took the green started a chain reaction that resulted in both drivers, plus a very unlucky Paul Rooks, getting up-side-down, with a luckless Dave Whell also involved. The throttle on the Q96 of Rooks got stuck open after contact with Butler, and while all drivers were, thankfully, able to walk away from the wreck, neither Butler, Lambert or Rooks were able to restart and all three have taken home some rather broken race cars. Whell was able to restart the event, which was promptly shorted to ten laps, but pulled out of the race before greeting the chequered flag. The race restarted with Geoff Davey and Peter Campbell from the front row and while Davey briefly emerged in front, Campbell powered around the high side to take control of the race. Brett Minett started challenging Brad Ayers, who seemed to have finally sorted out the mechanical issues that plagued him all night, while Dave Whell sat in fifth. Libby Ellis had a spin in turn four that brought the race under caution, with Campbell, Davey and Ayers to lead them back to the green. Minett was relentless in his pursuit of Ayers, persisting on the bottom until he was able to make his way underneath and into third, but there was no stopping Peter Campbell out in front as he raced to victory in the NQ22 racer. Geoff Davey secured second ahead of Brett Minett, with Brad Ayers across the line in fourth to secure the final transfer to the main race, despite his earlier mechanical problems. Jason King finished fifth ahead of Libby Ellis, while Dave Whell, Anthony Lambert, Paul Rooks and Adam Butler all failed to finish the event. Peter Lack and Lachlan McHugh shared the front row for the start of the A-Main, with McHugh leading the first time the lights went green. Unfortunately for McHugh the race was brought under caution and he was relegated to the second row, officials deeming him to jumped the start first time around. 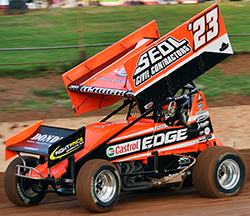 This elevated current Australian Sprintcar Champion Andrew Scheuerle to the front row alongside Lack for the restart, and while lack and Scheuerle raced side-by-side into the first turn, it was Scheuerle who emerged in front. McHugh made his way ahead of Luke Oldfield, with Oldfield soon surrendering positions to Brent Kratzmann and Bryan Mann, but contact between McHugh and Lack left Lack with damaged steering and saw him spin towards the infield before backing quite heavily into the tractor tyre marking the inside edge of the track in turn three. Lack was unscathed but sadly out of the race. Another full restart followed, with Luke Oldfield now elevated to pole position alongside Andrew Scheuerle. Oldfield secured the lead when the lights went green, with Scheuerle settling into a strong second while Lachlan McHugh and Bryan Mann negotiated over third. Brent Kratzmann started having a look for a way past McHugh and Mann, when Ben Hilder pounced on the low line, quietly slipping underneath Kratzmann and Mann and almost getting the better of McHugh as well as the quartet rounded the second turn. Kratzmann surrendered positions to Michael Saller and Kevin Titman before racing back underneath Titman as they rounded turn three. Kristy Bonsey had a great run in the Q42 racer, making her way underneath Allan Woods, the pair going on have a thrilling battle as Woods fought back on the high side. Kratzmann and Titman traded places as they fought over mid-field positions and tried to find a way past Saller, while out in front Oldfield had built a significant lead and was beginning to navigate lapped traffic. Unfortunately for Oldfield his race ended in disaster when he inverted the Q17 racer in truly spectacular fashion in turn three just five laps into the race. The car tipped up onto two wheels before rolling high into the catch fence in front of the large crowd in turn three before falling back to the track. Oldfield was able to walk away from the wreck unscathed, however the same cannot be said for his Q17 racer. Unfortunately for Ben Hilder a flat right rear spelt the end of his race as well. Andrew Scheuerle inherited the lead for the restart with Lachlan McHugh second ahead of Bryan Mann with twenty-five laps left to run. Allan Woods had a breath-taking run on the high side of Brent Kratzmann, the pair fighting over sixth position while trying to find a way past Michael Saller, and while Woods got the better of Kratzmann when the Q2 racer made a mistake in turn four, it was only a few laps before Kratzmann had closed the gap to Woods and was challenging him for position. Kratzmann slipped through underneath Woods as they raced through turn two, while at the front of the field Scheuerle was beginning to make his way through lapped traffic, with McHugh closing in fast. Scheuerle made his way through the back markers, systematically putting the lapped cars between himself and McHugh, but McHugh was quick to weave his way through, absolutely unrelenting in his pursuit of the Australian Champion and the race lead. Woods and Kratzmann continued to entertain the crowd as they fought over the minor places, while Kevin Titman closed in on Bryan Mann as they too made their way through the traffic. The battle for the lead intensified when Scheuerle and McHugh happened upon the lapped cars of Geoff Davey and Peter Campbell, who were having their own battle towards the rear of the field. McHugh got underneath Scheuerle and took control of the race as they rounded turn four, with Scheuerle having a look on the inside of McHugh a lap later as the pair tried to find a way through the battle between Davey and Campbell. Scheuerle briefly regained control of the race but it was McHugh who had clear track on the top side who managed to secure the lead. Kevin Titman eventually got the better of Bryan Mann as they rounded turn four, while Brent Kratzmann, who had pulled ahead of Allan Woods, and Michael Saller negotiated behind them. Kratzmann had a moment in turn one, while trying to find a way between Mann and Saller, that saw him loose some ground, allowing Woods to close the gap and resume his battle with the Q2 racer, but there was nothing anyone could do about McHugh out in front. Lachlan McHugh got the win ahead of Andrew Scheuerle and Kevin Titman, with Michael Saller forced to settle for fourth after almost getting Titman on the line. Bryan Mann rounded out the top five and led Allan Woods, Brent Kratzmann, Kristy Bonsey, Kevin Britten, Ryan McNamara, Geoff Davey, Andrew Corbet and Peter Campbell across the line. Brett Minett, Luke Oldfield, Ben Hilder, Brad Ayers and Peter Lack all failed to finish. Sprintcars Queensland will now take next weekend off before we enter the busy Easter Weekend with three massive nights of racing, starting with night one at Hi-Tec Oils Speedway in Toowoomba on Friday 19 April 2019. We will back that up the following night, Saturday 20 April 2019 at Ausdeck Patios and Roofing Archerfield Speedway, before returning to Toowoomba for the final on Sunday 21 April 2019. See you trackside!